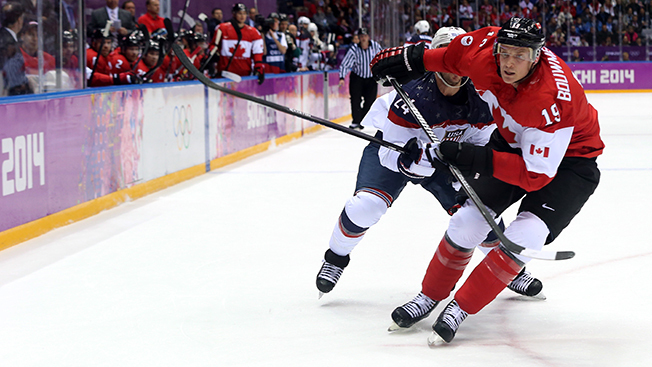 NBC Buys Big Twitter Ad for USA-Canada Hockey Webcast, but Why Is It Stopping There? NBC probably made a wise choice in buying Twitter's prominently featured Promoted Trend ad to alert folks about the USA vs. Canada hockey match today. Computer-tethered people tend to lose track of the clock while digging into their assigned projects, and heaven forbid North America gets anything done this afternoon. The Twitter ad unit costs north of $200,000 a day as a continent-wide purchase, and one would be hard pressed to find a marketer who'd disagree with the Peacock's spend allocation. But it's interesting that NBC so far has failed to buy Promoted Tweets around seemingly low-hanging Twitter terms such as #USAvsCanada, #BeatCanada or #hockey. (Interestingly, the NFL Network is owning the "hockey" term with multiple multimedia creative. See example below.) Those hashtags have trended nationally. Instead, NBC marketers have purchased ads round two clunky search terms—"USA Hockey Team Olympics" and "Canada Hockey Team Olympics"—that aren't nearly as likely to get in front of viewers. Promoted Tweets are purchased on a bids-based platform akin to Google AdWords that lets marketers target specific demos at relatively affordable prices. So if social buzz was important to NBC, why would it not blanket the social channel with a little more investment? "They have a fair amount of competition with Olympic-focused advertisers such as Visa, McDonald's and General Electric," explained Ammiel Kamon, evp, products and marketing for Kontera. "That tends to drive up the prices." But Kamon suggested that Promoted Tweets aren't necessarily difficult or cost-prohibitive to jump on if the real-time moment is important to a brand. "Twitter and Facebook have made a lot of money this Olympics," he added. "The majority of online spend has gone to social platforms rather than traditional banner ad buys."